ASSA 2018 is the annual conference of the American Economic Association, drawing together the economics profession in the US to discuss hundreds of papers and debate the key issues and ideas that mainstream economics considers. This year in freezing Philadelphia, there has been an obsession with President Trump, his antics and ‘Trumponomics’ if we can call it that. As Trump launched his latest tirade of weird tweets against a new book outlining his mentally unstable antics, the great and good of America’s mainstream economists considered his economic policies. And they were worried. Three things gripped the mainstream. The first was the apparent failure of globalisation since the Great Recession; the poor level of productivity growth in the major capitalist economies in the last ten years; and the effectiveness of Trump’s proclaimed protectionist trade policy that he has combined with slashing reductions in taxation on the US corporate sector and his rich elite friends. It seems that the mainstream is now aware that free trade and free movement of capital that has accelerated globally over the last 30 years has not led to gains for all – contrary to the mainstream economic theory of comparative advantage and competition. 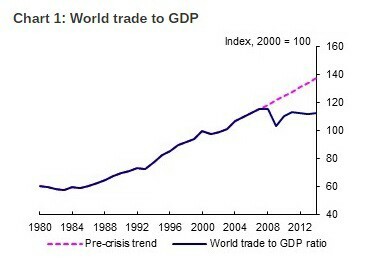 Since the end of the Great Recession, world trade growth has slowed almost to the level of global GDP growth – something unprecedented in the post-1945 period. And cross-border capital flows have declined sharply, particularly bank lending. And then along comes Trump with his threats to end US participation in trade pacts, to slap duties on Chinese imports and run a wall against Mexico etc. But the other factor about globalisation that has now dawned on the mainstream is that it has increased inequality of wealth and income, both between nations and also within economies as trans-national corporations move their activities to cheaper labour areas and bring in new technology that requires less labour. Of course, this is the basis of Trump’s appeal to those ‘left behind’. The Great Recession, the weak recovery in this Long Depression, the imposition of ‘austerity’ in public sector spending and huge cuts in taxation for the rich has engendered the rise of ‘populism’ ie anti ‘free trade, anti-immigration, anti-deregulation, anti-bankers. Rodrik in an opening plenary session reckoned that the problem with unbridled free trade and free movement of capital globally was that it was bound to intensify inequality of income because it often leads to increased “market failures” (another word for crises and slumps). Indeed, ‘compensation’ cannot credibly address the longer-term erosion of distributional bargains entailed in trade agreements and financial globalization. So it seems that, with the rise of Trump and other populists, mainstream economics’ blind faith in ‘free trade’ and free movement of capital as the mantra of capitalist success has been shaken. Of course, Marxist economics could have revealed this outcome of globalisation. David Ricardo’s ‘thought theory’ of comparative advantage has always been demonstrably untrue. Under capitalism, with open markets, more efficient economies will take trade share from the less efficient. So trade and capital imbalances do not tend towards equilibrium and balance over time. On the contrary, countries run huge trade deficits and surpluses for long periods, have recurring currency crises and workers lose jobs to competition from abroad without getting new ones from more competitive sectors (see Carchedi, Frontiers of Political Economy p282). It is not comparative advantage or costs that drive trade gains, but absolute costs (in other words relative profitability). If Chinese labour costs are much lower than American companies’ labour costs, then China will gain market share, even if America has some so-called “comparative advantage” in design or innovation (contrary to the view of Phelps). What really decides is the productivity level and growth in an economy and the cost of labour. So far from globalisation and free trade leading to a rise in incomes for all, under the free movement of capital owned by the trans-nationals and free trade without tariff and restrictions, the big efficient capitals triumph at the expense of the weaker and inefficient – and workers in those sectors take the hit. Now the mainstream has woken up to this fact, even if they have not dropped comparative advantage theory. As one session paper put it: “the distributional effects of financial globalization, unlike those of trade, have gone largely unrecognized. In fact, however, episodes of capital account liberalization are followed by an increase in the gini coefficient and top income shares and declines in the labor share of income. These distributional effects hold with a de jure measure of liberalization and only get stronger when this measure is scaled by the extent of the capital flows that ensue in the aftermath of liberalization. Financial globalization emerges as a robust determinant of inequality, even after accounting for the effects of trade, technology and other drivers.” (Jeffry Frieden, Harvard University). But it was also expressed in one of the ASSA sessions held by the Union of Radical Political Economy (URPE). In the David Gordon memorial lecture, longstanding Marxist economist John Weeks talked of “authoritarian tendencies” having a “quantum leap” both in Europe because of “austerity” and in China and Vietnam where central planning has been replaced by “market authoritarianism”. But is the reason for the rise of reactionary semi-fascist nationalism due to ‘the excesses” of neoliberalism, finance capital (but not industrial capital?) and austerity? Or through changing the nice “sensible principles” of government management of the economy that apparently started with the New Deal and continued (“briefly”) with the consensus post-war Keynesian policies? I don’t think this is a convincing explanation. Keynesian or New Deal policies of fiscal and monetary management of the capitalist economy, in so far as they were ever applied (and that was limited indeed), collapsed in the 1970s and neoliberal policies of financial deregulation, globalisation and the reduction of the welfare state came in. But that was not because politicians decided to ‘change the rules’ and ‘rational’ Keynesian policies were dispensed with for the greed of the 1%. This is the argument of the mainstream liberal economists like Joseph Stiglitz who wrote a book exactly along those lines. But it was not a change of ideology alone – it was the result of forced circumstances for capitalism from the late 1960s onwards. The capitalist mode of production got into deep trouble as the profitability of capital plunged everywhere. A drastic reversal of economic policy was necessary. Out went the Keynesian ‘revolution’; in came monetarism, Hayekian free markets, the crushing of unions and the ending of trade barriers and government intervention. This worked for capitalism for a whole generation and profitability recovered (at least somewhat) at the expense of labour, mainly through a rising rate of exploitation (as well as globalisation). But, as Marx’s law of profitability argues, the counteracting factors to the tendency for profitability of capital to decline over time do not work forever. The global financial crash, the ensuing Great Recession and the subsequent Long Depression confirmed that the era of globalisation and neoliberal policies were no longer working. And now the consensus among mainstream economics is broken. Rethinking economics is now the cry. It was not the ‘excesses’ of neoliberalism and globalisation that caused the rise of nationalism and Trump, but the failure of the capitalist mode of production to deliver. The likes of Stiglitz, Phelps, DeLong, Krugman etc want to ‘change the rules’ back so that capitalism can be ‘managed’. But this is an illusory aim unless the profitability of capital returns on a sustained basis. In his address, Marxist John Weeks naturally went further than the mainstream Joseph Stiglitz in his policies for change. But, in my view, it won’t be enough just to “reform” markets “to prevent the power of financial capital from creating fascism for the 21st century and so rebuild “social democracy for the 21st century”. The capitalist mode of production must be completely replaced, if labour is to benefit and future crises are to be avoided. And that means a global planned economy to mobilise resources, innovation and labour skills, let alone to end global warming and climate change. In part 2 of ASSA 2018, I’ll discuss the papers presented in sessions of the radical economists attending. This entry was posted on January 7, 2018 at 10:07 am and is filed under capitalism, economics, Profitability. You can follow any responses to this entry through the RSS 2.0 feed. You can leave a response, or trackback from your own site. The reason we are seeing a trend toward authoritarianism is because the technology now allows it. There has always been an authoritarian tendency in Capitalism, but it is only now that the anarchy of capitalism can be fine tuned to be more authoritarian. Its a great time to be a capitalist! Though that may well be a short lived thing! Don’t know if that’s quite right, Edgar. Authoritarian regimes have existed since the 19th century, making use of whatever technology was available. We are seeing a trend towards authoritarianism now because of the slow “recovery” from the not-a-credit crunch contraction of 2008, 2009. Economics, not technology, calls the tune. Yes I am aware that authoritarian regimes have existed but I contend that the trend in the so called liberal democracies to a more authoritarian character is due to being able to deliver authoritarianism without impeding the ‘market’, via technological solutions. Cameras, face recognition, tracking on line activity etc etc. From Google censorship, NSA spying to local authorities using mobile technology to fine people for a variety of minor misdemeanors the ruling class have a relative bonanza of techs that allow them a level of control unimaginable to the great authoritarians of the past. They will not give up that power whether we are in a slump or in a boom. They are aware that the next slump ot the next boom is always just around the corner. And where is the class capable of organizing itself on a global basis with sufficient strength to insist on a globally planned economy? Your analysis is persuasive but your solution is a fantasy. Yes, why “a global planned economy”? History shows that a single large country can build socialism, and if it has more than ten years to do it before a Nazi onslaught, that is even better. 1. 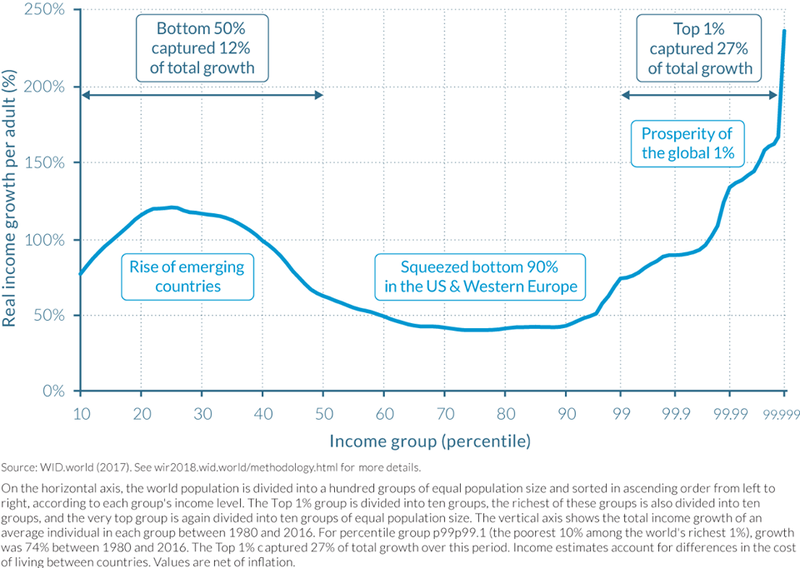 The logarithmic horizontal scale is cute, but the “elephant graph” still vividly illustrates what it’s original author pointed out – a dramatic decline in global inequality. Only the top 1% has exceeded the income growth of the bottom 50%. 2. I would have hoped for just a little more embarassment from the anti-globalist “left” at being outflanked in conservative and reactionary opposition to the revolutionary impact of Free Trade trade by Trumpism. My eyes glazed over half way but what I did read was ambiguously siding with the Trumpists in objecting to the enormous gap in living standards being reduced between the large majority of workers in developing countries and the small minority in the developed countries. Typo – I meant to say “unambiguously siding with the Trumpists”. PS While I am at it, no I don’t despise the globalist liberals any less than I despise the Trumpists. I agree with both sides about each other – they are both despicable. Its just that the mainstream spouting Trumpism doesn’t strike me as having “woken up”. That’s a strange way to define inequality. The New York Times, on December 8 2017 reported that globally, the top 1% secured 20.4% of all income, up from 8% in 1980, while the lower 50% secured 9.7% up from 8.0%. The lower 50 percent in the US, Canada, the EU, China, India, and Russia, compromising more than half of the total income, saw absolute declines in their share of national income. If we measure by proportions of total income we get one picture. I am more interested in proportions of total population and specifically of the global working class. To me the interesting thing is that the old division between workers in developed and developing countries is being narrowed so that a larger and more united proletariat is confronting a tinier number of “magnates of capital” (whose income and wealth are both very difficult to ascertain but undoubtedly becoming more concentrated). Naturally Trumpists and liberals are more interested in playing the better offf workers in developed countries against the poorer workers in developing countries and pretending that the latter becoming less desperately poor is at the expense of the former. Equally naturally the “elite” top 5-10% by income are struck by their decline relative to the billionaire class. One can either sympathize with their desire to avoid proletarianization along with the bulk of humanity or help them adapt to uniting with the rest of the working class against a common enemy. It is quite pathetic how successfully Trumpists are able to portray these people as an “elite” and attract poorer workers in developed countries to a united front with billionaires against both their local elite and “foreign” workers. The fact that liberals, including “marxians” share a fundamentally similar “anti-globalist” outlook makes this much easier. Most of the “anti-imperialist” movement took up campaigns against globalism and specifically NAFTA long before Trump did and are still attracted to the Sanders wing of the Democrats who are quite clear about agreeing with Trumpism on that. Correct measures of concentration of income and especially wealth are important. Gini index, comparisons of percentciles, deciles, quartiles, quintiles etc can bring out different aspects without such obvious distortion as a pseudo-logarithmic graph. I suspect the most precise measure would be entropy (corresponding to Engels description of the polarization between wealth and poverty under capitalism working as inevitably as the chemical dissolution at the two poles of a battery as long as the current is being extracted). From memory, the original author of the “Elephant Graph” (who did not use “cute” scaling) specifically suggested “Theil Entropy” for concentration statistics. Saez, Piketty and Zucman report at equitablegrowth.org, and an article there, “A Tale of Two Countries”, describes income growth in the U.S. and then compares France to the U.S. The lower 50% in the U.S. between 1980 and 2014 experienced 1% growth in income, from $16,000 to $16,200, the top 1% saw 200% growth, from $420,000 to $1.3 million (all are per adult income). The gap enlarged from times 27 to 81, a tripling. The lower half received no growth, percentiles 50 to 90 took in about a third of all growth, percentiles 90 to 91 took in about a third, and the top 1% took in 36%. Then they showed that the lower half in France has an average adult income of about $19,000 a year, compared with the U.S. lower half of $16,200. France’s economy produces about 2/3rds that of the U.S. per capita. If the U.S. had the same distribution ratio as France then U.S. lower half adult would have average income of $29,000, not $16,200. So France, a capitalist nation has made their capitalism perform better, but is that performance enough to satisfy the socialist ideal? I doubt it. The benefits of cooperative production are still unknown, maybe not quantifiable. I imagine that first we shall see movement to make economies more like the French economy, and then we will see even further advances towards cooperative production, socialism. The 4th place runner-up in the recent French presidential election, Melenchon, was advocating a maximum income, $360,000 a year Euros not $, with a 100 % tax rate on all income above $360,000. Wikipedia: “Domestic policies proposed by Mélenchon include a 100 per cent income tax on all French citizens earning more than 360,000 Euros a year, full state reimbursement for health care costs, a reduction in presidential powers in favour of the legislature, and the easing of immigration laws.” This is not socialism, but it’s a step towards a society that shares its prosperity, as the Saez, Piketty, Zucman paper demonstrates. I imagine societies moving in the way France is moving, and then contemplating cooperative ownership or market socialism, and then going the full distance of a Parecon shared economy based on planned production, reduced inequality, social assurances. About profitability of corporations, eventually planning will grant profitability and by a democratically endorsed action. I write a blog, Economics Without Greed, http://benL8.blogspot.com. I’m slowly converting to socialism. Slowly. I support Robin Hahnel’s vision.